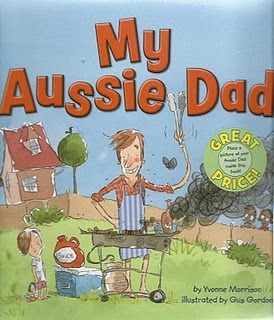 My Aussie Dad is a humorous rhyming picture book for young children with a feel good ending that will delight all.. On each double spread we meet a different dad doing the Aussie thing. There is the dad burning the chops at the barbie, the DYI dad and the beach cricket dad. Most of the dads are casual, laconic blokes but there is also a dad in a business suit and the stressed out camper. Australia's multicultural society is not ignored. Non-Anglo dads are also depicted in Gus Gordon's wonderful pencil and watercolour illustrations that extend the text with irony and humour. Endpapers with illustrations of dads and their essential equipment such as sauce, thongs and a footy add to the enjoyment of the book. There is also a framed space saved at the front endpaper for a picture of the book owner's dad. My Aussie Dad represents exceptional value and is ideal to be shared by fathers with their children.